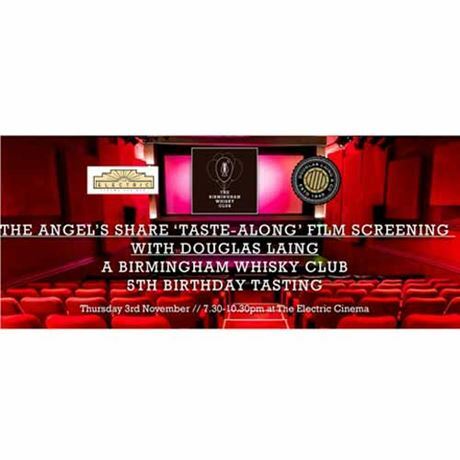 To kick off the festivities for The Birmingham Whisky Club's fifth birthday, we're hosting a Douglas Laing & Co 'drink-along' screening of award-winning film The Angel's Share at one of Birmingham's most iconic venues, The Electric Cinema. Jan Beckers, global ambassador for Douglas Laing & Co, will guide you through a selection of four whiskies from the brand's delectable Provenance and Old Particular single cask whisky ranges at key moments during the film. 7.30pm - You are welcome to arrive any time from 7:30pm to grab a drink from the bar and start the festivities. 7.45pm - Doors open. Either head to your luxurious sofa or find a seat. You'll be presented with a glass and your first whisky of the evening. 8pm - After a short welcome from the Birmingham Whisky Club, Jan will talk you through your first whisky of the evening, as well as giving you some information about Douglas Laing. 8.10pm - Screening commences. The film will be stopped at key moments and more whiskies will be handed out for you to enjoy and learn more about the wonderful 'water of life'. 10.30pm - Although the event is over, feel free to stick around and ask our resident whisky experts any burning questions you might have. Tickets are £25.50 for a standard seat. This includes access to the screening and whisky tasting. No refunds or transfers. Event is strictly over-18s only.